It has been shown that hospitals and health care centers with better design result in better patient outcomes. The result has been a hugely successful trend of redesigning healthcare centers and hospitals to be more patient-centric. Research supports that hospitals and medical centers with inviting interior design increase patient comfort and can even aid in patient healing. Here are five beautifully modern and effective design ideas for any type of healthcare center, from expansive hospitals to private practices. Exam and treatment rooms are designed for cleanliness, often with minimal furnishings, but that doesn't mean these rooms need to be boring. This doctor’s office uses an eye-catching geometric print with shades of blue to match the rest of the room's design. 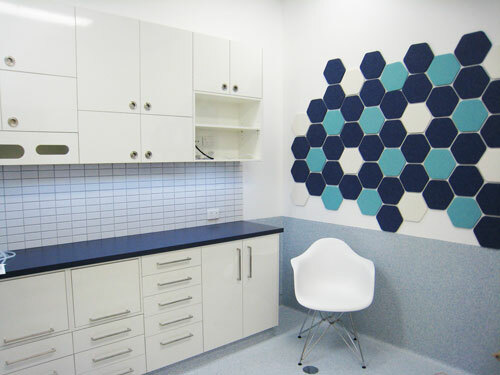 EchoPanel Geometry Tiles look purely decorative to patients, but this peel-and-stick acoustic tiling helps improve privacy by reducing noise from traveling in and out of the room. Confidentiality is essential in examination rooms. Reducing outside noise helps keep patients who are waiting for their exam results relaxed and calm. 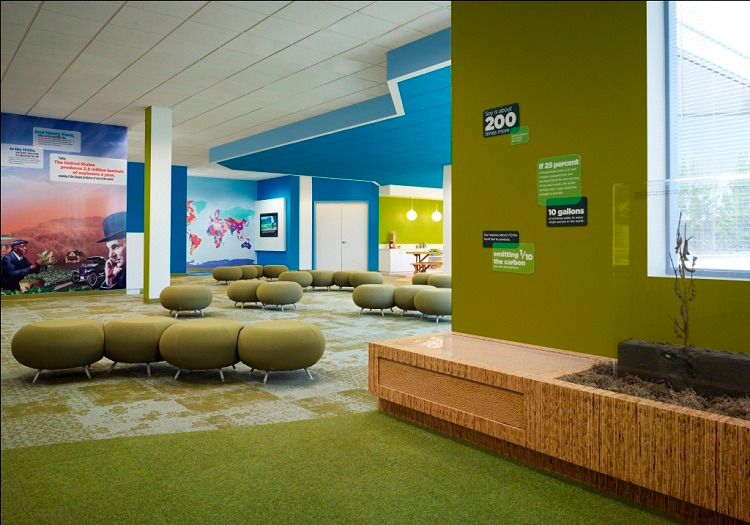 Lobbies and waiting areas are a great space to get creative and add color. Too many healthcare facilities get stuck on neutral colors for their furnishings and decor, leaving a great opportunity to bring cheer to their patients. 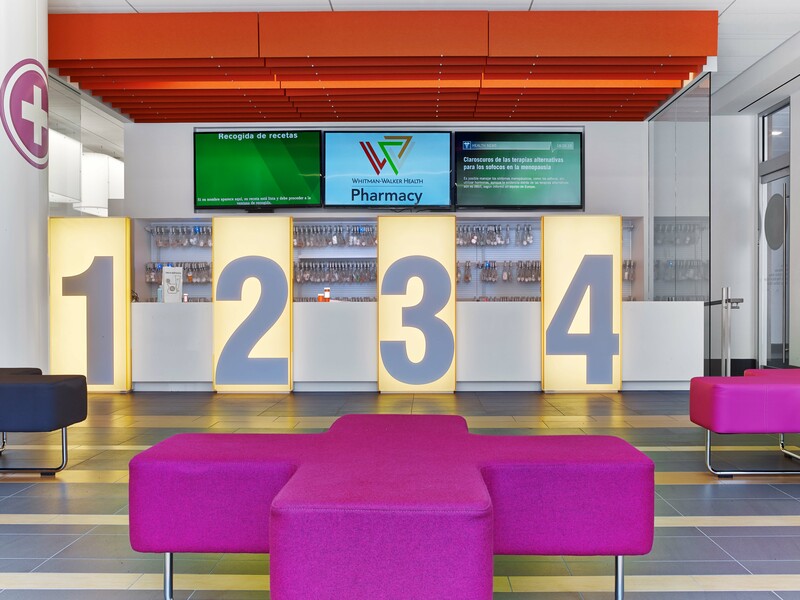 The pharmacy waiting area of the Whitman Walker Health Care center is anything but boring, with bright fuschia bench seating, large illuminated queue displays, and a stylish orange ceiling design. This ceiling showcases Simple Baffle, an acoustic baffle system that can be directly mounted or hung from any type of ceiling at any height. 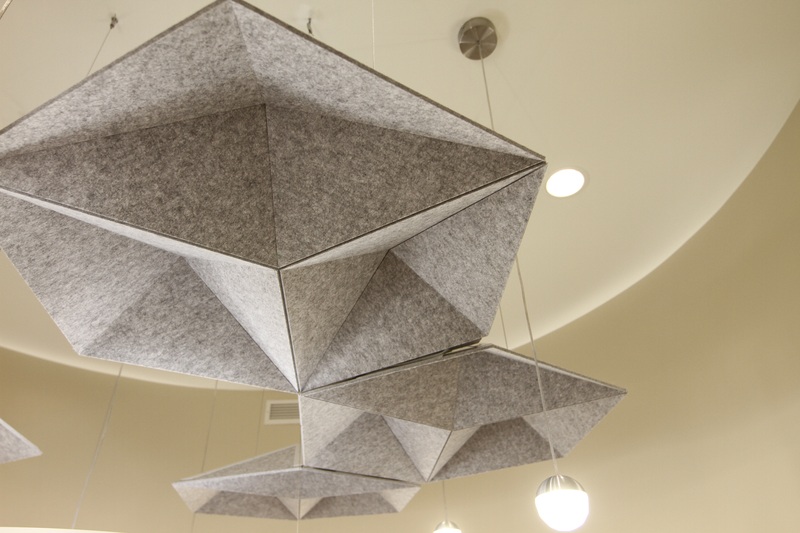 Available in both the original Simple Baffle or custom designs, there are plenty of options to choose from to create a functional ceiling that looks like an art installation. Open waiting areas and lobbies can make it tricky to reduce noise travel, but ceiling treatments like Simple Baffle help control noise to keep confidential interactions private and ensure a more pleasant wait for patients. Environmental and human health coincide, so find ways to include furnishings made of eco-friendly materials in healthcare facilities: it’s beneficial for aesthetics and overall patient comfort. This lovely waiting area has a very natural feel thanks to the shades of green, organically shaped round seats, and a bench/plant container combination. This bench and plant container combo is made of Kirei Board, which is made of sorghum straw and an adhesive manufactured with no-added formaldehyde. This wood alternative gives the space a modern look with a distinctively natural design. Healthcare staff often need quiet spaces to do their jobs effectively and efficiently. This is why we’re seeing more healthcare facilities providing office spaces and reception areas with acoustic soundproofing. This helps to dull noise and allows staff to focus on their tasks and work more easily with patients. 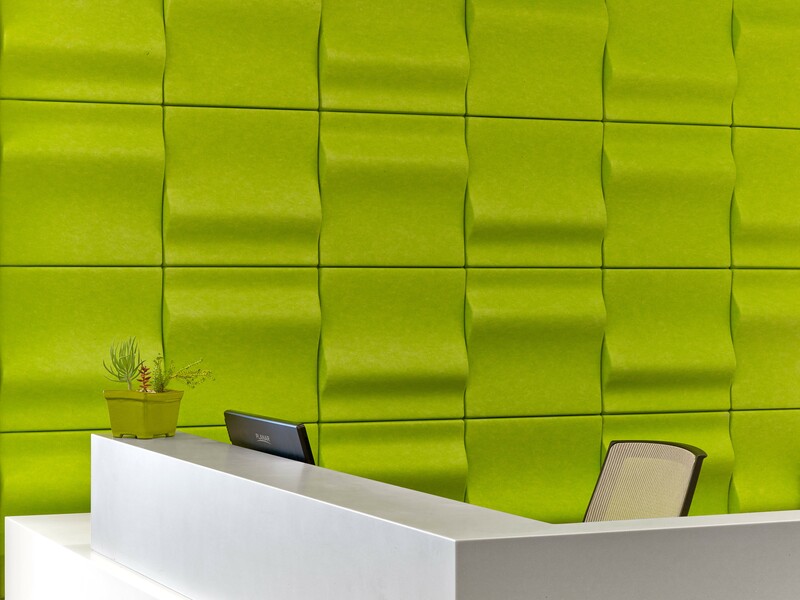 This example of the wall above is clad in Mura Wave Tiles, a Kirei EchoPanel product that was designed to be quickly and easily installed in busy spaces. These tiles are exceptionally lightweight thanks to their hollow backing, which makes Mura Tiles impressively sound absorbent. Mura Tiles comes in both Wave and Dune styles, an array of different colors, and use a speed clip installation system. High ceilings certainly make rooms seem larger and more open, but often it’s at the expense of increased noise reverberation. 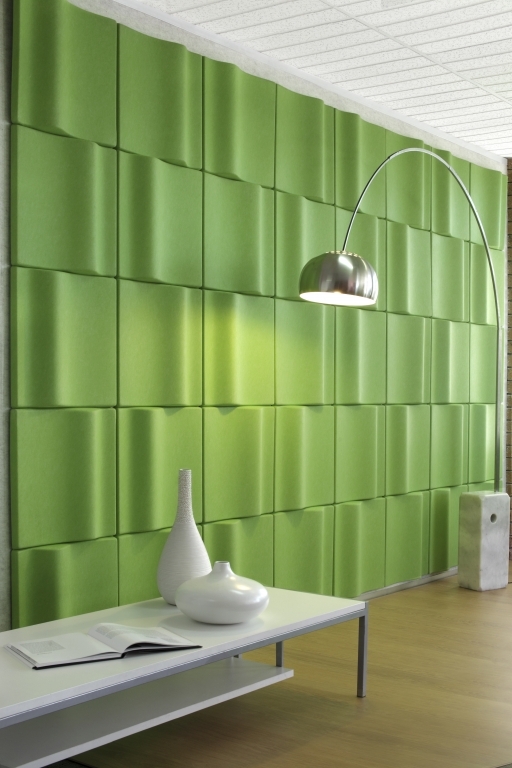 A way that you can quickly remedy this is by hanging sound absorbing products that perform double-duty as decor. The example above is Hanging EchoStar fixture from this ceiling of Fort Qu'Appelle Renal Health. This diamond faceted EchoPanel product is specifically designed to reduce noise in rooms with vaulted ceilings. The EchoStar looks more like a hanging art piece than functional sound dampening equipment, which adds dimension and depth to an otherwise tall, sterile room. The idea of healthcare facilities being clinical and barren settings, designed to accommodate medical equipment rather than people, is outdated. As you can see, the options for attractive, patient-focused healthcare design are almost limitless. With solutions like these offered by Kirei, you can simultaneously improve the aesthetic and the functionality of your healthcare facility with ease. Looking for more solutions in healthcare design? Check out specific products and design ideas on the healthcare industry section of our website.